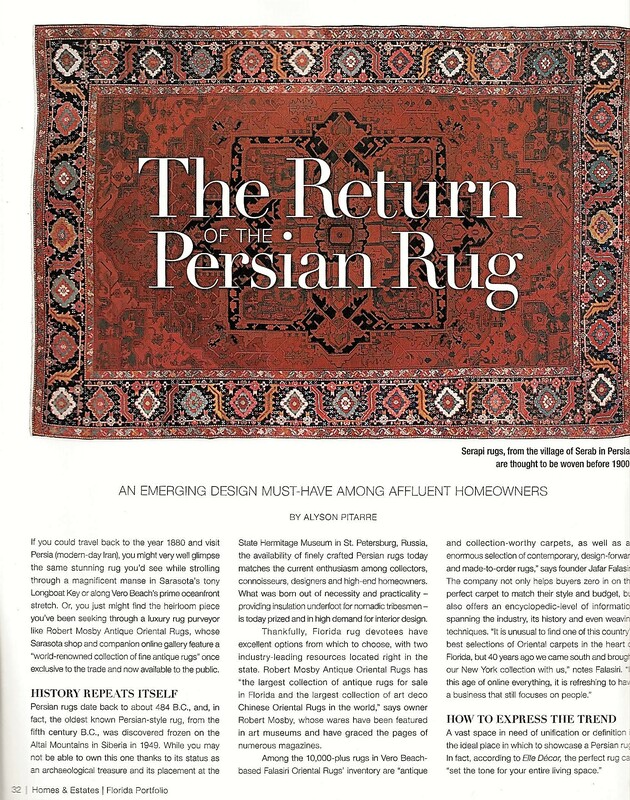 This type of rug is well described in this article published in 1915. I attach the image of a rug currently owned by Mosby Antique Rug (#7588). 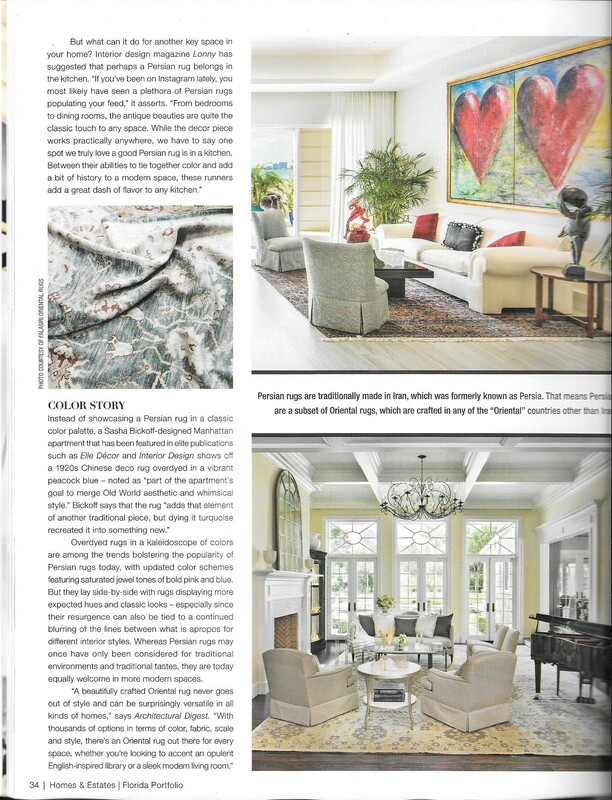 As you can see, the difference between the rug in the article and ours is the size and its condition. This is a very rare rug to find. Super Awesome Oriental Rug Art! This is SO cool that I had to share it with my customers. British sculptor Debbie Lawson works in the space between two and three dimensions, forming wild animals that emerge from old-fashioned rugs. 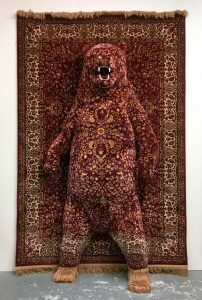 The artist builds her animals from scratch, using chicken wire and masking tape, and then covers them with identical or near-identical Persian carpets to create the illusion that the creature is fused with the hanging rug. Red Bear is on display until August 19 2018 at the Royal Academy of Arts in London as part of the 250th Summer Exhibition curated by Grayson Perry. Persian bear is permanently displayed (along with a moose in the same style) at London’s Town Hall Hotel. You can see more of Lawson’s finished works and take peeks into her studio process on Instagram. Where was your Oriental Rug Woven? 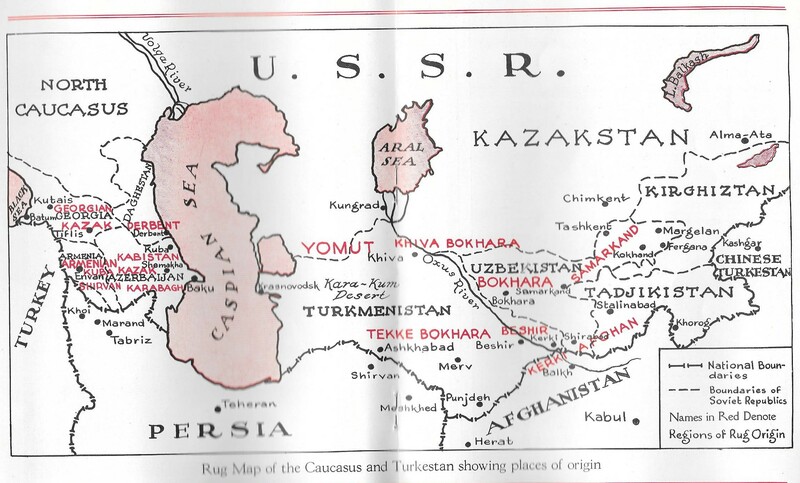 Here is a map of historic regions important to the weaving of Oriental Rugs. 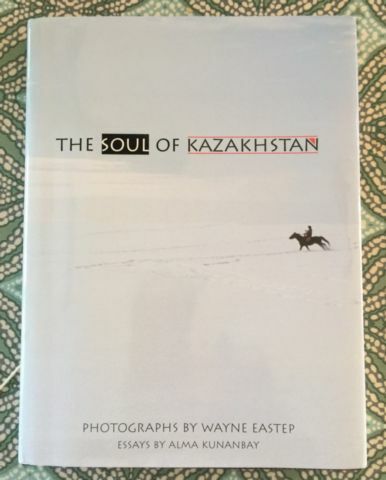 A fabulous exploration of modern life in Kazakhstan as seen through the lens of photojournalist Wayne Eastep. Engaging copy and stunning photographs give you insight as to what life is like on the steppes and cities of Kazakhstan today. Buried in the permafrost, the worlds oldest rug. 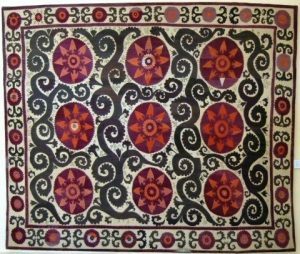 The Pazyryk Carpet. The Pazyryk (Russian: Пазырык) burials are a number of Scythian Iron Age tombs found in the Pazyryk Valley of the Ukok plateau in the Altai Mountains, Siberia, south of the modern city of Novosibirsk, Russia; the site is close to the borders with China, Kazakhstan and Mongolia. Numerous comparable burials have been found in neighboring western Mongolia. The tombs are Scythian-type kurgans, barrow-like tomb mounds containing wooden chambers covered over by large cairns of boulders and stones, dated to the 4th - 3rd centuries BCE. The spectacular burials at Pazyryk are responsible for the introduction of the term kurgan, a Russian word of Turkic origin, into general usage to describe these tombs. The region of the Pazyryk kurgans is considered the type site of the wider Pazyryk culture. The site is included in the Golden Mountains of Altai UNESCO World Heritage Site. The bearers of the Pazyryk culture were horse-riding pastoral nomads of the steppe, and some may have accumulated great wealth through horse trading with merchants in Persia, India and China. This wealth is evident in the wide array of finds from the Pazyryk tombs, which include many rare examples of organic objects such as felt hangings, Chinese silk, the earliest known pile carpet, horses decked out in elaborate trappings, and wooden furniture and other household goods. These finds were preserved when water seeped into the tombs in antiquity and froze, encasing the burial goods in ice, which remained frozen in the permafrost until the time of their excavation. Because of a freak climatic freeze, some of the Altaic burials, notably those of the 5th century BCE at Pazyryk and neighbouring sites, such as Katanda, Shibe, and Tuekt, were isolated from external climatic variations by a protective layer of ice that conserved the organic substances buried in them. Certain geometric designs and sun symbols, such as the circle and rosette, recur at Pazyryk but are completely outnumbered by animal motifs. Such specifically Scythian features as zoomorphic junctures—i.e., the addition of a part of one animal to the body of another—are rarer in the Altaic region than in southern Russia. The stag and its relatives, however, figure as prominently in Altaic as in Scythian art. 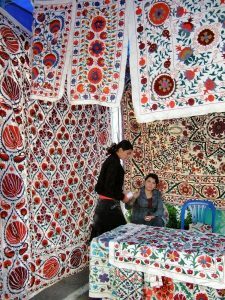 Suzanis, the large-scale decorative handmade wall panels, are some of the most popular kind of Uzbeks and Tajiks embroideries. 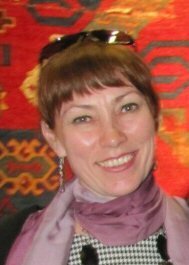 They hold a very special place in traditional Central Asian culture. 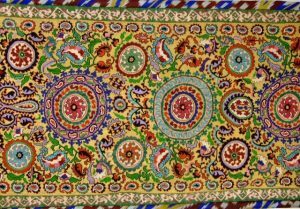 Such kind of embroideries along with carpets decorate the living rooms of Central Asian inhabitants. Admirers of traditional textiles value Suzanis for their vigorous coloring and original patterns, natural materials and refinement of embroidery skills. Meanwhile, their true sense are often hidden from us. The important role of Suzanis are connected with the belief to the magic forces of their patterns. 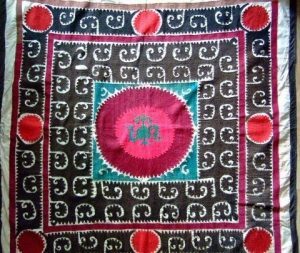 Scholars have already marked the common protective value of suzani embroideries, such as their usage in ceremonial and cult practice as protective force. The patterns within the embroideries also carry the same protective meaning, as well as having their own unique historical interpretations. Each element is a part of the Universe, and the composition is a image of the World, with harmony and balance, sometimes unachievable in real life. Suzanis of each regions or center have their own local features. Astral and solar symbols predominate in Tashkent and partly in Samarkand Suzanis. In Tashkent Suzanis are known as palak (heavens, arab. ), oy-palak (moon heavens) or yulduz-palak (star heavens). The images of heavenly stars are the ancient tradition, which roots go to the ancient strata of culture. The artisans considered these patterns provided the heaven protection. Step-by-step old cults were replaced by the new ones – as a result, astral symbols transformed into vegetative and floral symbols (Surkhandarya and Samarkand Suzanis, for example). Transformation of solar forms into vegetative symbols reflects the change of religious representations in a society and depreciation of old symbols. Vegetative motives in Suzanis are a reflection of the everlasting nature. The content is connected with the ancient cult of fertility, which has preserved by centuries for example in Ferghana Valley Suzanis. Urgut Suzani, second half 20th century. Some patterns are the results of the influence of creativity by professional artists, who worked in the courts of Muslim rulers and produced the so called court carpets. They created compositions with palmettes, flanked by leafs, blossoming flowers, rows of bunches of flowers etc. ; these magnificent flowers were symbols of a Muslim paradise garden. Some Bukhara, Nurata and Shahrisabz Suzanis are a free imitation of popular carpet drawings (gul-buta, gul-dasta, chorshoh-u yakmoch – four branches and one moon – compositions). Tashkent Suzani, first half 19th century. Some motives, especially in rural embroideries, are related to nomad’s art. Carpets of semi nomadic tribes are the basic source of this influence. The “carpet” motives include kuchkorak and mujiz-nuska (ram’s horns) motives, the most ancient and most widespread in steppe art. Thereby, some part of patterns is a heritage of local ancient settled and nomadic cultures; the content of these patterns have been connected with Zoroastrism, Sun and totemic cults, and also a cult of nature revival. The other part was formed under the influence of Islamic aesthetics (some floral compositions, which can also be seen in other kinds of medieval textiles). The meanings of former solar, Zoroastrian and totemic symbols have been forgotten. Instead craftswomen have considered these patterns simply “useful” and protective. As a result, many names of motives don’t reflect their original sense. Nevertheless in each case Suzani drawings is the image of an ideal universe, unity of magic and beauty. Suzani embroidery is the unique phenomenon of late medieval culture of Central Asian’s cities and villages; it has kept the ancient archetypes and medieval symbols in the patterns and has reflected interaction of various historical and art traditions. We fully recommend that anyone interested in a most fascinating book should acquire this quintessential volume on the study of Saddle Rugs. A Comprehensive Study of Saddle rugs from Ningxia, Gansu, Inner Mongolia, and Tibet from the 5th Century BC with 288 Full Color Plates in English And Chinese! A ‘Limited Edition Copy signed by the Author’ of this 2 volume set is available through this link to the authors website. We actually have a few on hand in the US for immediate shipping if you contact us! WASHINGTON, May 30, 2008 — One of the most elegant times in America was the Jazz Age of the 1920s and 30s. It was a time when, after the horrors of World War I, there was a taste for extravagant clothes and debonair film stars. Long silk gowns, men in ‘smoking’ attire and, on living room and bedroom floors, not antique Turkish and Persian carpets but – surprisingly – newly made Chinese ones. Why Chinese? 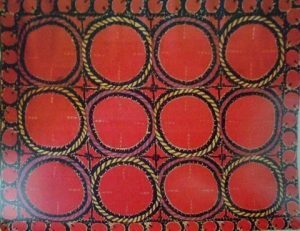 The answer is the strange story of the ‘Chinese Art Deco’ rugs. They were carpets that perfectly fit the spirit of their time and today still evoke that time and no other. But they came about almost by accident. One of those accidents was the fact that World War I badly disrupted the usual Mideastern trade links for luxury carpets from Turkey and Iran. Another was that people wanted a break from the past in the design of virtually everything, from buildings to furniture to fabrics. These opportunities were recognized by American entrepreneurs working in Tianjin, China. The port city, south of Beijing, was a major center in the international wool trade and until the 1900s had no history of rug manufacturing. But the expatriate U.S. traders soon turned it into one of China’s biggest weaving areas as they filled the vacuum in the American market, first with traditional Chinese carpets and then with more and more Western-looking variations of the originals. The most successful design that emerged was something that perfectly fit the Art Deco style of the day. The carpets so complimented what was going on in the West that they became known as Chinese Art Deco even though there was no Art Deco movement in China itself. One American entrepreneur’s name in particular is associated with the rugs: Walter Nichols. He produced so many of them in Tianjin that Chinese Art Deco rugs are also known generically as ‘Nichols’ rugs. But it has long been debated whether he and other American producers actually designed the carpets or whether the Chinese artists which they employed did so. Elizabeth Bogen, one of the few rug scholars who has studied Tianjin rugs closely, believes it was the Chinese artists. She finds her evidence in the fact that while the rugs were made for the American market – where Art Deco was characterized by industrial-looking, streamlined forms – great numbers of the Chinese weavings are effusively curvilinear and floral. And those curvilinear patterns seem much less inspired by what was happening in America than by the more naturalist-looking Art Deco tradition in France, half-a-world away. So how to explain the contradiction in styles? Bogen observes that by the 1920s there were Chinese students who had studied art in many major art schools in Japan and Europe and were familiar with international trends. Bogen made these suggestions in her article “What the Wool Trade Wrought,” which appeared in the September-October 2001 issue of Hali Magazine. The design origins of the Chinese Art Deco rugs may never be fully known. 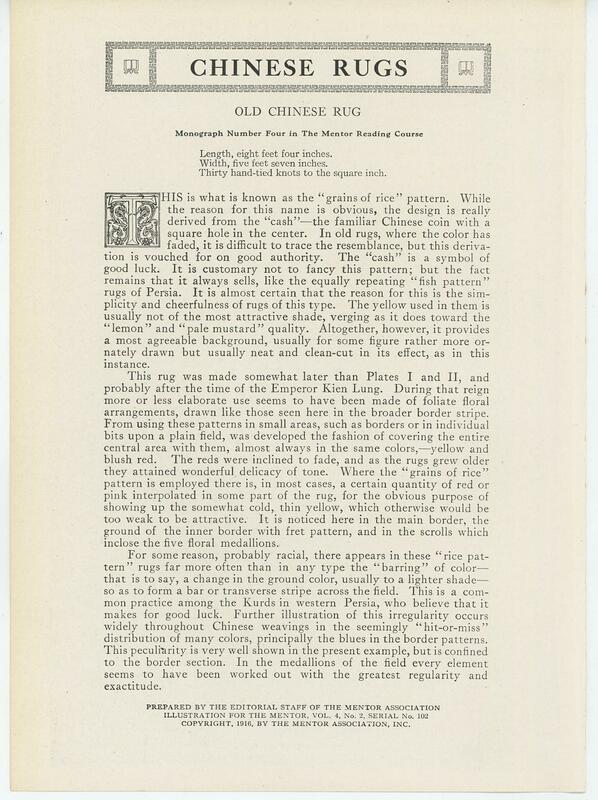 But the whole story leads to some interesting speculation about how Eastern designs get modified for Western tastes and whether the results are in fact Eastern or Western creations. Put in other words, this is a reminder that the greatest tradition in art, even in the most traditional arts, is to freely borrow ideas across borders. To try to classify art – and particularly the contemporary art of any period – as belonging to one region or another is to miss the excitement of how art reflects a universal human experience as much as it does a local one. BEIJING, Dec. 18, 2010 – Like the other countries of the ancient Silk Roads, China has a rich carpet tradition. But it is a younger heritage than those of Central and South Asia or the Middle East and very much unlike them. Because the first pile carpets in China seem to have been woven only some 500 years ago – in the 15th century — it seems clear pile carpet weaving arrived to China from elsewhere. The best guess is that the technique traveled up the Silk Road into northwestern China from neighboring East Turkestan. Northwestern China was, and is, a vast steppe land peopled mostly by Turkic-Mongol peoples. At that time, these steppe lands, which today include Inner Mongolia, were outside the Great Wall protecting China proper. So, the early carpets were not ethnically “Chinese” — in the sense of the Han Chinese who lived within the wall (outlined in red here). But for reasons that still fascinate historians, they almost immediately became a medium for Chinese – not nomadic – art. And it is that quality which makes Chinese carpets so unlike their more “oriental” relatives. Carpet scholars Muray L. Eiland Jr. and Muray Eiland III write in their book Oriental Carpets (1998) that “although it is possible that the pile carpet is not indigenous to China and was introduced from Central Asia, its designs have become as classically Chinese as those of textiles of porcelain. That the carpets should become so classically Chinese is surprising because the steppe lands — which are a rich wool producing region — had a millennia-old tradition of felt carpet making with its own rich vocabulary of motifs. But it may be that by the 15th century, the people of northwest China already were heavily influenced by the overwhelming culture of China proper. It is likely, too, that in many of the main commercial centers for the rugs, such as Ningxia right beside the Great Wall, urban populations were already ethnically mixed. 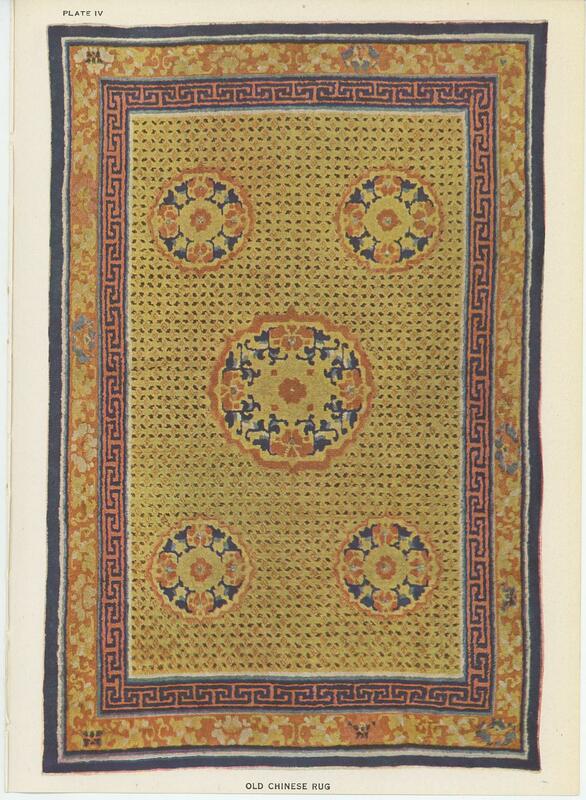 The rugs woven in northwest China had several markets. One market was the nomadic lands to the north, Mongolia and beyond, where the rugs were used to decorate yurts. 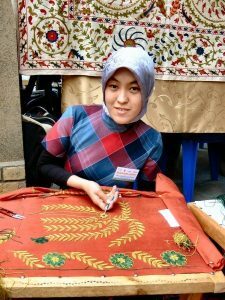 A second market was Chinese Muslims who needed substitutes for prayer rugs, which were not woven in China. And the third and richest market – and the one which undoubtedly did the most to determine styles and designs — was temples and noble homes. Ningxia rugs, for example, were used extensively in the monasteries of Tibet and northwest China. The temple carpets included Banner rugs, Hanging rugs, Curtain carpets and Pillar carpets. The Pillar carpets were sometimes made in two halves to fit around a column. Picture here is a column carpet from the 1880s in the Victoria and Albert Museum’s collection. Interestingly, special colors were reserved for special audiences. Yellow was reserved for royal use, such the court and temples, while red was for gift carpets exchanged between aristocrats. But if these pile carpets are so distinctly Chinese in appearance, does it mean that the indigenous people of the northwest contributed no influence of their own? Hans Bidder, a German diplomat and carpet historian who lived many years in China before his death in 1963, believes the felt carpet culture of the steppe lands had a great effect on how the pile woven carpets were decorated. Bidder is particularly intrigued by the way the fields of Chinese carpets so often appear to be blank canvases upon which motifs – from animals to Taoist and Buddhist symbols – are placed in almost ‘applique’ fashion. Often the motifs stand out so dramatically from the background that almost appear to have been inlaid into the field of the carpet the way motifs are rolled and pressed into the plain backgrounds of felt carpets. The appearance is sometimes heightened by cutting the pile to put the motifs in even higher relief – a practice that remains very common in Chinese carpets today. That preference for high relief makes a fascinating link not only to the art sensibilities of the nomadic felt makers but also to a period in China’s own history when – due to the Mongol conquests of the 13th century – felt carpets briefly and unexpectedly rose to the level of a court art in Beijing. It is interesting to speculate on how much this experience may have helped set the subsequent taste for bold, high-relief motifs on knotted rugs. 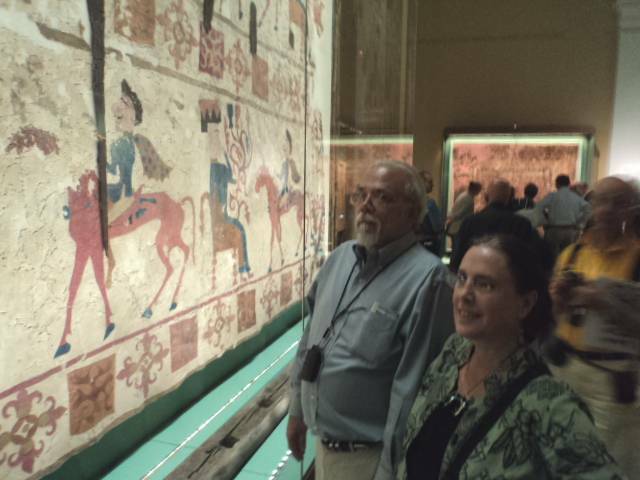 But the impact of Mongol rule on Chinese rugs may have been still larger than that. Bidder notes that ancient China – the Han peoples within the Great Wall – traditionally associated wool with the barbarian world. Their fabrics of choice were cotton and silk, instead. It was only through centuries of contact with nomads on the northern border that Chinese slowly began to adopt the use of felt mats as utilitarian floor coverings or insulation padding on beds. The example of the Mongol court would have done much to convince Chinese to regard wool as an artistic medium, as well. Still, when weaving looms for carpets arrived in China, many people still regarded them as something alien. Bidder, a scholar of Chinese texts, cites the earliest known mention of the technology as noting the “weaving process has been taken over from the barbarians and is performed in their strange way.” The book was written sometime in the Ming period of the 14th to 17th centuries. But if wool carpet weaving took hold relatively late in China, it rapidly developed into a major industry. These centers thrived in the 17th, 18th and 19th centuries, setting the stage for the phenomenal growth of the Chinese export carpet industry when China opened to the world and major new weaving centers appeared in Peking and its nearby port Tiantsin. From historical records, it appears wool looms appeared in Beijing in the early 1860s. There carpet-maker developed new patterns based on Ningxia carpet designs but which progressively responded to Western market demands. Like the earlier Chinese carpets, the new Peking rugs depicted Chinese symbols and designs used for hundreds of years. But where the symbols tended to be profuse and cluttered together on domestic rugs, the new rugs spaced them out — usually around a central medallion — in harmonious designs more suited to western tastes. 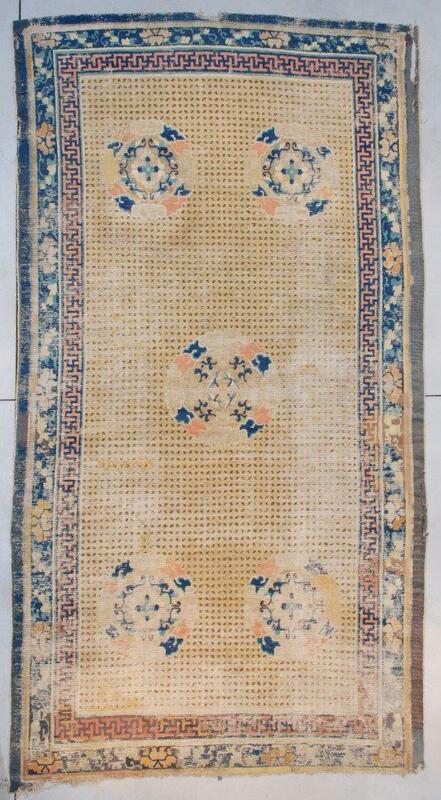 Blue Peking rugs made in Western room sizes gained huge popularity, particularly in America. They were followed by other rugs directly produced for the American market, often by companies owned by American expatriates in China. The most famous of these “American” exports were the Chinese Art Deco rugs of the 1920s and 1930s. The term Art Deco refers to the style launched at the 1925 Paris World's Fair Exhibition of Modern and Industrial Decorative Art. 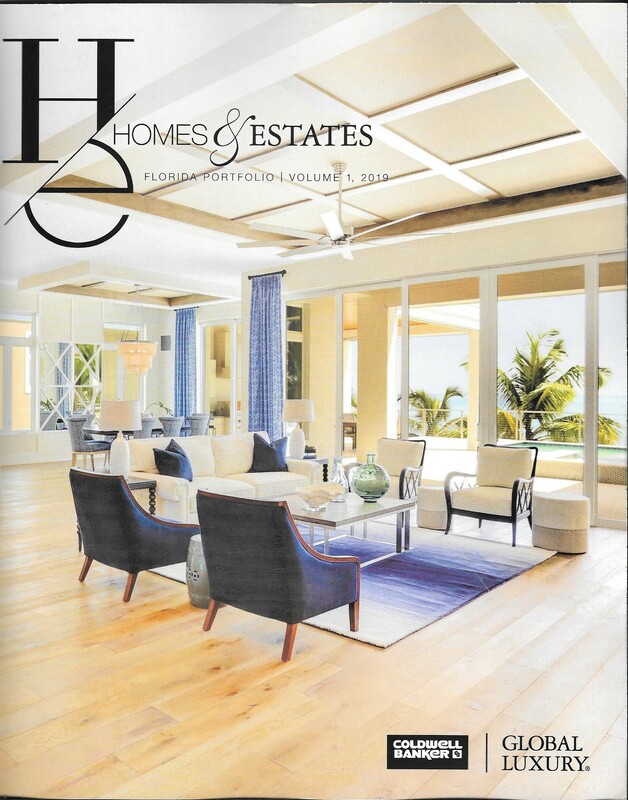 Art Deco rugs introduced a new, nonrestrictive color palette. Bright, never-before-used combinations were the new trend. The soft blue of traditional Chinese rugs was replaced by a more vibrant lapis blue, while the traditional calm gold gave way to varying shades of ochre, green, raspberry, plum, purple and teal also became popular. Because of its low production costs, China became the hub for weaving Art Deco rugs exported to the States. There were hundreds of factories producing rugs but it was two enterprising Americans who dominated: Helen Fette and Walter Nichols. Little did they know their names would become synonymous with the term and virtually all rugs woven during that era, which ran from the mid 1920Ã¢â‚¬â„¢s to around 1935. Helen Fette went to China as a missionary, selling small rugs to raise funds for charities. She teamed up with Chinese rug manufacturer Li Meng Shu to form the Fette-Li Company. They started producing rugs out of the Peking area in the early 1920Ã¢â‚¬â„¢s and were one of the largest exporters of the period. Fette rugs are recognizable by their floppy feel. The cotton warps are thinner and more pliable than those used in Nichols carpets, resulting in a soft, supple feel to the pile. In 1924 Walter Nichols opened the doors of his venture, Nichols Super Yarn and Carpets in Tientsin, North China. Super Yarn because of the machine spun yarn, the strong cotton used for the foundation, and the overall tightly packed weave of the rugs. In stark contrast to his Fette counterpart, a Nichols rug was quite dense and heavy. Both Fette and Nichols placed identifying fabric tags on the back of their rugs. Nichols also stamped his name onto the backside of the fringe, however if the fringe has worn down or been repaired, the mark is usually absent. Because Fette and Nichols were so closely associated with the Deco period, rugs woven in their trademark style, absent any remaining identification marks, are routinely referred to as Fette or Nichols style. No other Oriental rugs are as representative of their time as the Chinese Decos. The dynamics of the designs and the colors used are hallmarks of the era. It was a time of experimentation with abstract forms and unrestrained colors. The style arrived energetically, but was cut short due to the Great Depression. The few remaining factories were destroyed when Japan invaded China during World War II.